(Brennan Linsley | The Associated Press) In this Aug. 12, 2015, file photo, water flows through a series of retention ponds built to contain and filter out heavy metals and chemicals from the Gold King Mine. On Wednesday, March 13, 2019, the Environmental Protection Agency set three long-term goals for cleaning up the Bonita Peak Mining District Superfund site, which includes the Gold King. The goals are improving water quality in streams, stabilizing mine waste piles to keep more pollution from leaching into waterways and preventing big releases of tainted water from mine shafts. Denver • The U.S. Environmental Protection Agency announced three long-term goals Wednesday for cleaning up the Bonita Peak Mining District Superfund site in southwestern Colorado. 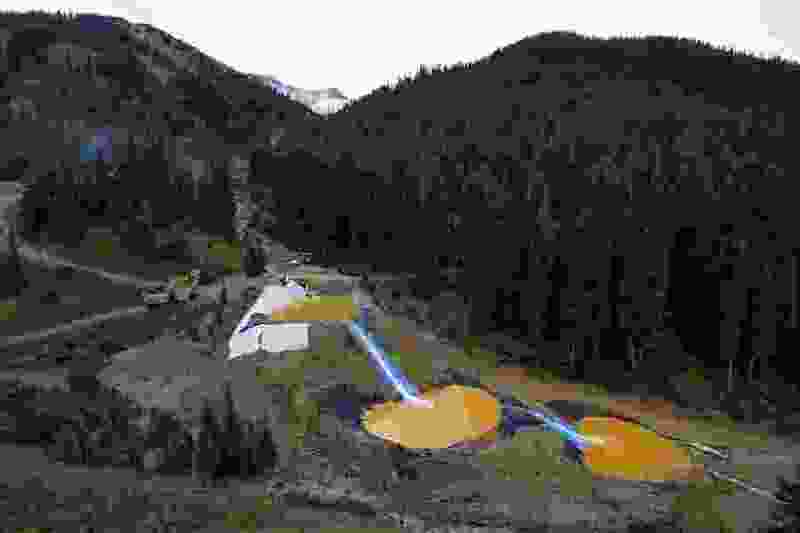 The Superfund site was established after the EPA inadvertently triggered a massive spill of 3 million gallons of wastewater from the Gold King Mine in 2015, tainting rivers in Colorado, New Mexico and Utah with a yellow-orange plume carrying toxic metals. The Gold King is one of 48 mining-related sites included in the Superfund cleanup. The goals are preliminary and could change, said Rebecca Thomas, the EPA's team leader for the Bonita Peak district. The EPA will develop more specific objectives later, she said. The water quality cleanup target areas include portions of the Animas River, the South Fork of Mineral Creek and Upper Mineral Creek. The goal includes meeting or exceeding state water quality standards and improving the habitat for fish and other aquatic life, said Doug Benevento, EPA's regional administrator based in Denver. Wastewater sometimes pulses out of old mines, but it's impossible to predict when, Thomas said. The bursts could be caused by tunnel collapses or other events, she said.